Adding a monogram is a fun way to make items special and personalized. We added personality and fun to a few socks using Stencils and Fabric Paint. This project will only take a few minutes, and will give you results that you will love. This is a fun project to get the children involved. 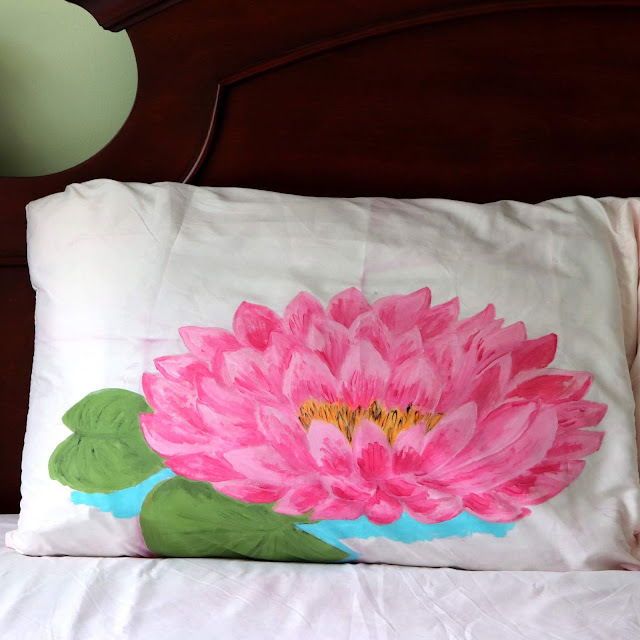 Children and adults alike will enjoy using stencils to make these unique, fabric painted pillow cases. My five year old son was happy with the results. He really enjoyed painting over the stencils and was very impressed with the final product when we removed the stencils. Jake and the Never Land pirates: Peter Pan returns is available on DVD since April 3rd; it has over 2 hours of special features. This story is about Peter Pan's missing shadow. While Peter was playing the game Catch-me-if-you-can, he looses his shadow and Captain hook takes it. He goes to ask his friend Jake's help. His friends Izzy, Cubby and parrot Skully join to work as a team to find Peter's shadow. Peter needed his shadow to fly so he had to get it back from captain hook. Painting egg shells. This could be a lovely activity for anytime of the year. To make these Pirate eggs we need to remove the inside yolk and white. First shake the egg carefully, then use a sharp skewer or fork and pierce the narrow end of the egg. Make the pierced part a little big, place a bowl and invert the egg to remove the inside and save it for cooking. Wash and let the eggshell dry upside down. 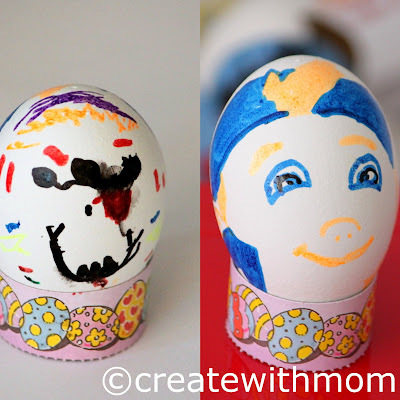 We painted these eggshells using sharpie pens. Cut a strip of light board or construction paper about 1" wide, for the length measure the circumference of one side of the egg. Then slit 1/2" on one corner of the strip from the top and for the other corner cut from the bottom 1/2" (click on the above picture and look closer). The slits should go into each other and attach. 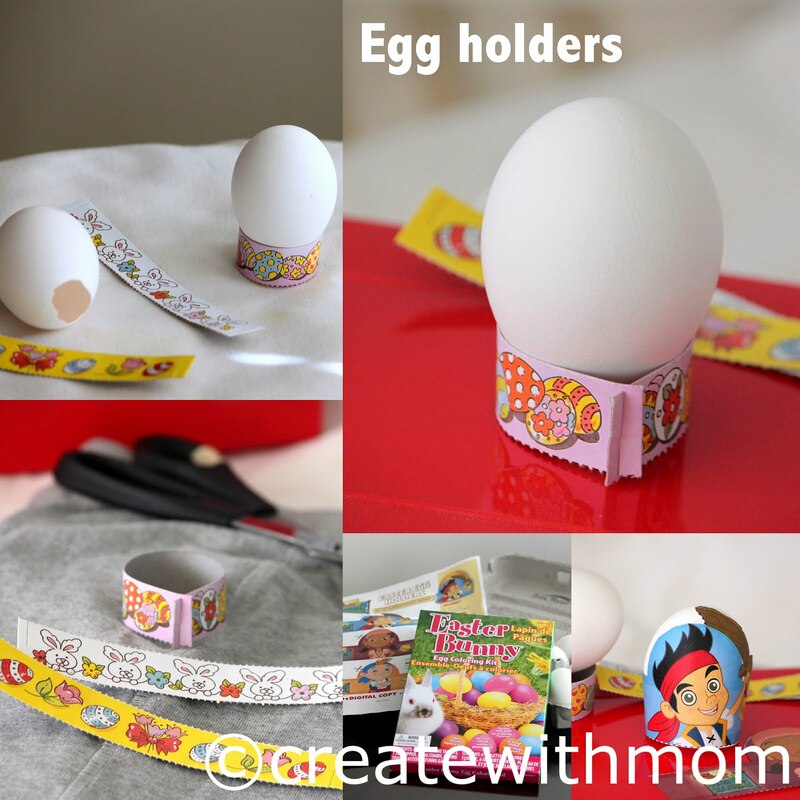 In the 2nd linked image there are pirate themed printable egg holders. Free printable Disney activities. Click on the image to download and print. 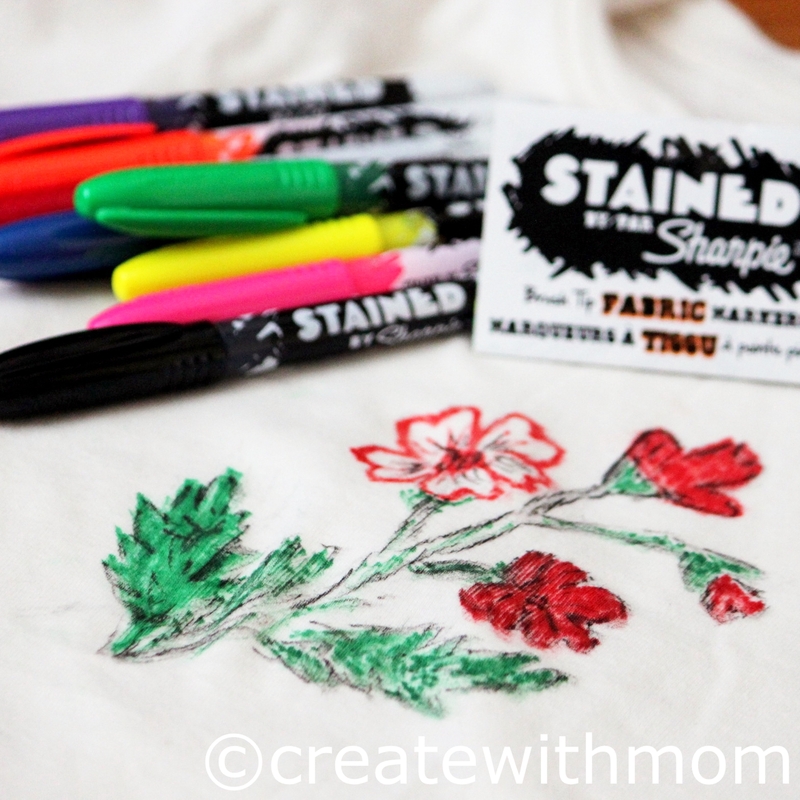 Sharpie® has launched a new product Stained by Sharpie, which is a marker to paint on fabric. It is a brush tip with fabric ink that creates thick and thin lines. Ink is AP-certified and non-toxic. 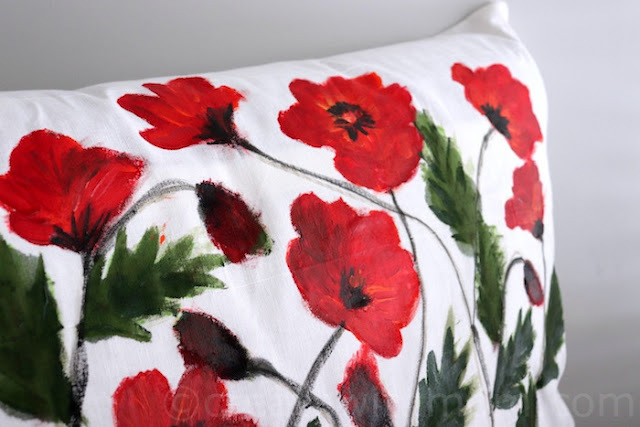 The paint doesn't fade on most fabric when washed on a normal wash cycle. It is suggested for best results the clothes stained by the markers should be hang to dry. There are eight vibrant colours sold individually and in packs of 4 and 8. Here is a design I painted on my daughter's shirt. All I had to do is keep a pad of paper under the shirt, so it doesn't stain the back of the shirt and paint on it. There was no need to iron or do any other step after painting. It was so easy that we are planning on colouring more fabric. 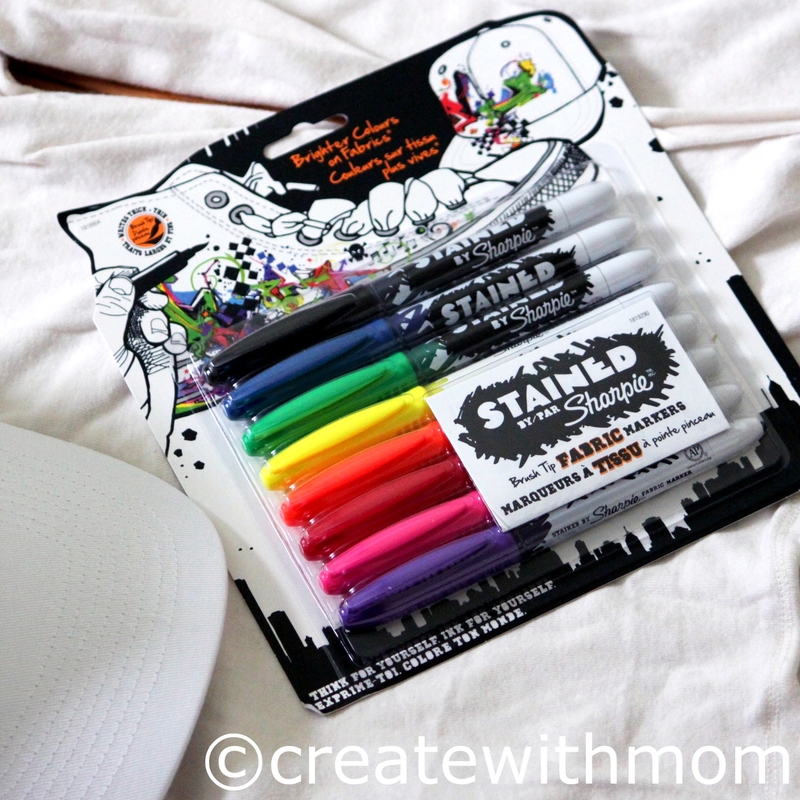 It makes it so much easier to personalize fabric items with these markers i.e. sending things to school and trips. So get a hold of these cool Stained by Sharpie markers, and express yourself by turning your everyday items to something special anytime anywhere. 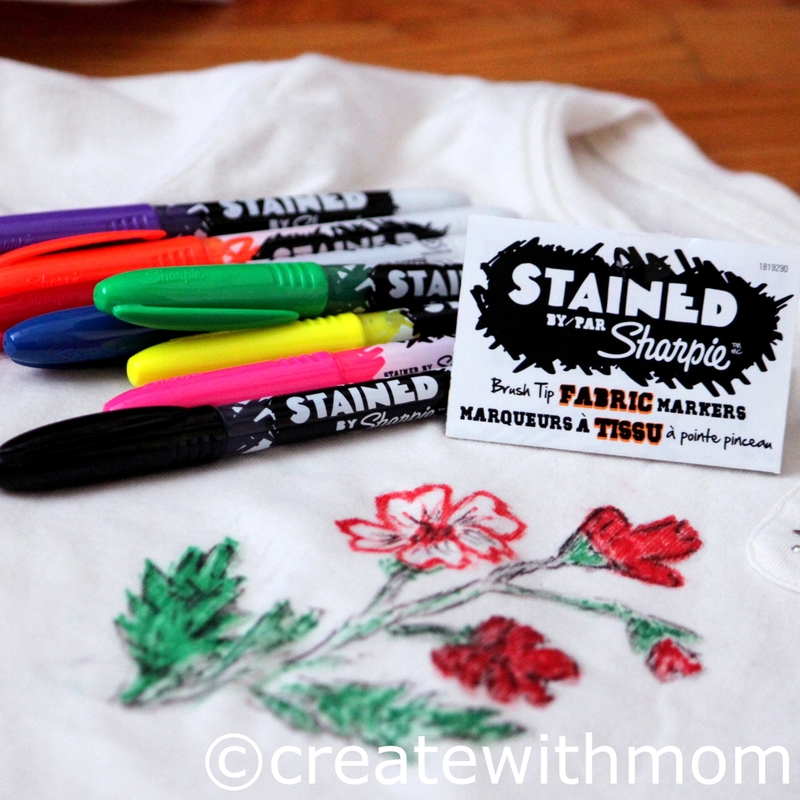 In April Sharpie and MuchMusic will team up to inspire and showcase Canadian Sharpie creations. To win a prize pack $50 worth of products from Sharpie® please leave a comment on this post and tell me what would you do with these markers. The giveaway is open for everyone in Canada and ends on March 15th. 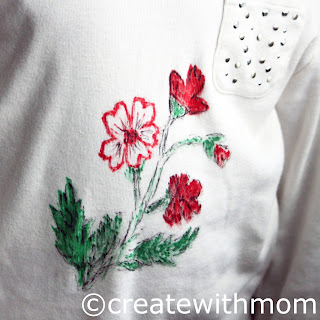 Please follow Createwithmom on google friends, twitter and Facebook to know about more reviews, giveaways and contests.